‘The mission of Iowa Great Lakes Association is to promote environmental improvements to the Iowa Great Lakes area’. The Iowa Great Lakes Association is a multi-issue organization that strives to be an active influence in promotion for environmental health and quality-of-life in the Iowa Great Lakes region. We support organizations whose environmental missions include protection of the Iowa Great Lakes watershed area. Weather you are a homeowner or visitor, the lakes are what bring us all to the area. The Iowa Great Lakes area is a wonderful place to live and to enjoy. 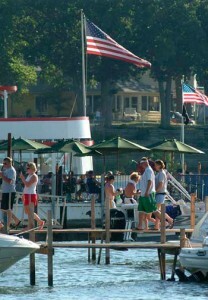 It attracts visitors from all over the Midwest and boasts many attractions other than the lakes. If the lakes are environmentally corrupted it is inevitable that our communities will cease to flourish. That is why IGLA actively embraces the goals and objectives of sister organizations whose views are shared as they relate to the environment and the protection of the lakes. IGLA endeavors to create influence and advance the ability to be more effective at accomplishing goals. “I spent many summer vacations on Lake Okoboji. I grew to love the Iowa Great Lakes just as my father and grandfather had. I wanted to do whatever I could to protect the lakes and keep them as I knew them when I was a young man,” Bill Van Orsdel, founding member. Both homeowners and visitors are encouraged to join IGLA. While it is our lakes that bring many of us here, it’s the community that bonds us. Whether it’s a day on the water, a bike ride through the trails, or this is your permanent home, the Iowa Great Lakes area is a wonderful place to be. As a 501c4 organization, IGLA has the ability to make major accomplishments no other Lake Association can. IGLA can lobby, initiate legal actions and advertise. For example, we recently lobbied the Iowa Legislature for $1,000,0000 for Center Lake Restoration. IGLA also initiated legal action to encourage Dickison County and Milford to install 2 more culverts at the Lower Gar Outlet.